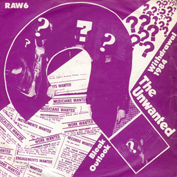 A punkclassic on RAW records with that charactaristic sound created in Spaceward studio. Well, I hope I´m right when I make a guess on that studio…the cover doesn´t tell and neither does the label but IT SOUNDS like a spaceward recording. What happened next to this great band? The back of the sleeve on The Unwanted’s ‘Secret Past’ comp LP says “recorded 22.8.77 at Spaceward”, so you guessed right. Singer Ollie Wisdom (whom I stole my pseudonym from in 1983) went on to be the singer in the Goth Glam band Specimen. He’s now a techno DJ. That’s a bitter end for every man, becoming a techno dj.